Just minutes from Gillette Stadium! Take Rt. 128 or Rt. 95 to Rt. 1 south in Norwood. Follow Rt. 1 south into Foxboro (DO NOT take Pine St. exit in Walpole!). Go PAST Gillette Stadium and take a right at next traffic light (Pine St. exit, Lafayette House restaurant and Seasonal Specialty Store on right). Follow exit road to end and make a right onto Pine St (Rt. 115). Go less than 2 miles and Fore Kicks will be on your left hand side. Take Rt. 495 North to Rt. 1 north into Foxboro and follow to Pine St. exit traffic light (Seasonal Specialty Store Plaza on left). Make a left and follow exit road to end and make a right onto Pine St (Rt. 115). Go less than 2 miles and Fore Kicks will be on your left hand side. Take Rt. 495 South to Rt. 1A (Wrentham Outlets exit). Turn left onto Rt. 1A (South St.) and follow (turns into Dedham St.) Rt. 1A thru Wrentham center. Stay on Rt. 1A (Dedham St.) and follow across Rt. 140. Go 1.5 miles to next traffic light, make a right onto Rt. 115 (Pine St.). Fore Kicks will be 100 yards down on your right hand side. 85,000 Sq. Ft. Indoor Sports Megaplex Building! 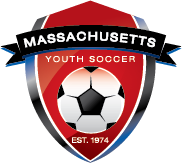 Featuring 7 indoor sport arenas on 3 different surfaces including the revolutionary new synthetic grass surface, artificial turf surface and olympic quality gymcourt/futsal surfaces. 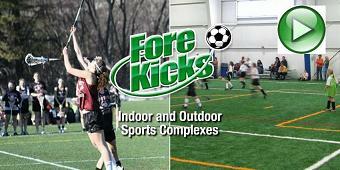 Multiple sports including indoor golf driving range, non boarded soccer, boarded soccer, Futsal, box lacrosse, field lacrosse, field hockey, basketball, volleyball, golf, tag football, ultimate frisbee, baseball, softball and more. Now Fully Air Conditioned including all playing fields for year round comfort! Brian Silva designed (2000 Golf Magazine Golf Course Architect of the year), links style 9-hole executive par 3 golf course with holes ranging from 85 to 160 yards. Additional facilities include a 9 hole professional putting course, 10th hole clubhouse, indoor driving range, snack bar, up to 200 person function facility and golf/soccer sports pro shop. Golf lessons with our PGA pro available year round. Full golf course lighting with state of the art Musco lighting system is now installed for night time golf. Practice your golf swing on our 10 bay indoor driving range. Take Golf lessons with our PGA pro (available year round). Click Here for Driving Range Information. The convenience of our own onsite, new fully stocked athletic store featuring quality golf, soccer and lacrosse equipment, accessories and footwear at great prices. Golf specializing in quality junior golf club sets for ages 3-15, teen sets, ladies and mens golf sets. Our new Cardio and Strength Fitness Center is now open. Featureing a full line of CYBEX Eagle top of the line strength machines and cardio equipment including the new Arc Trainers plus Smith Machine and free weights area. Now Open 7 days a week until 11pm. Click here for more information. Including air conditioned elevated players lounge and observation deck, catered function rooms for up to 200 people, and our golf course "10th Hole" refreshment center. Available for birthday parties, teams, companies, organizations and groups for various functions and corporate events. Over 5000 sq.ft. of air conditioned function room space is available plus multiple meeting rooms. Full catering service, beer and wine bar, and other amenities are available. Featuring state of the art instruction, and clinics covering multiple sports and programs including golf, soccer, field hockey, lacrosse, football, basketball, volleyball, baseball/softball, personal fitness, personal health and wellness programs (Yoga, Tai Chai, etc) and more. Fore Kicks's nationally acclaimed Lil Kickers program is ideal to introduce and develop children 1.5 yers through 8 years old.